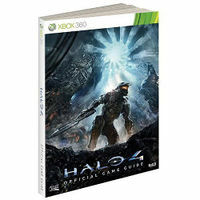 The Halo 4 Official Game Guide is the official strategy game guide of Halo 4. It was released alongside the game in November 6, 2012 throughout the United States by Prima Publishing. It is readily available in two forms: the standard edition and the collector's edition. Introduction to all the Halo video games released so far. Introduction to prominent characters encountered throughout Halo 4. Detailed intel sections on enemies, weapons and vehicles encountered and/or utilized throughout the game. The Collector's Edition of the Halo 4 Official Game Guide. Cover art without standard Xbox 360 logos. Finalized cover art for the standard edition. Horizontal cover art for the Collector's Edition. Vertical cover art for the Collector's Edition.